Advertisers spend more money on campaigns that reach the right audience. Plus, users find targeted ads more relevant and useful. To help you ensure that ads reach a specific audience and increase the value of your inventory, DoubleClick for Publishers (DFP) offers multiple targeting options that enable you to more precisely control when, where, and to whom, ads appear. DoubleClick’s technology can recognize a number of factors that can be used in deciding which ads to serve: the visitor's location (country, region or state, metro, and city), day and time, user's domain, user's operating system, browser, browser language, and bandwidth. Today, we’re excited to release a new addition to this list with zip and postal code targeting. Postal code targeting allows you to take your geo-targeted campaigns a level deeper to precisely reach users in specific markets. For example, you can now target users on Manhattan’s Upper West Side neighborhood (10023, 10024, 10025) instead of geo-targeting the entire New York metropolitan area. DFP currently supports targeting to U.S. zip codes and Canadian postal code prefixes. To get started, simply click the 'Postal code' tab in the targeting picker and paste in a comma-separated list of postal codes or prefixes. As with other geo-targeting, you’ll be able to measure the effectiveness of your campaigns by using 'postal code' as a dimension when generating reports. We look forward to adding the ability to target postal codes in additional countries in the future, and hope that with the expansion of postal code targeting, you’ll be able to reach your audience more effectively. In June we launched the +1 button for websites, making it easier to recommend content across the web. In July, the +1 button crossed 2 billion daily views, and we also made it a lot faster. Today the +1 button appears on more than a million sites, with over 4 billion daily views, and we're extremely excited about this momentum. It's just the beginning, however, and today we're launching two more features that make +1 buttons more useful for users and publishers alike. Clicking the +1 button is a great way to highlight content for others when they search on Google. But sometimes you want to start a conversation right away—at least with certain groups of friends. So beginning today, we're making it easy for Google+ users to share webpages with their circles, directly from the +1 button. Just +1 a page as usual and look for the new "Share on Google+" option. From there you can comment, choose a circle and share. When you share content from the +1 button, you’ll notice that we automatically include a link, an image and a description in the sharebox. We call these "+snippets," and they're a great way to jumpstart conversations with the people you care about. 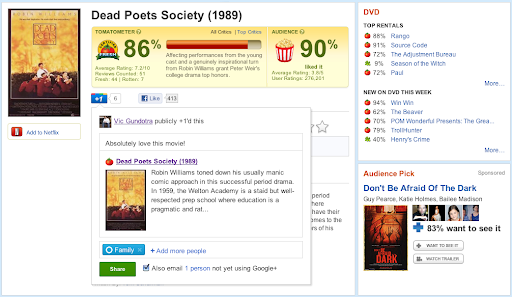 Of course: publishers can benefit from +snippets as well. With just a few changes to their webpages, publishers can actually customize their +snippets and encourage more sharing of their content on Google+. More details are available on the Google Webmaster blog. We're rolling out sharing and +snippets globally over the next week, but if you’d like to try the new +1 button now, you can join our Google+ Platform Preview. Once you're part of the Preview, just visit a site with the +1 button (like Rotten Tomatoes) and +1 the page. Thanks for all of your feedback so far, and stay tuned for more features in the weeks and months ahead! Our display benchmarks have met with much enthusiasm since we first started publishing the data in 2009 and we’re pleased to introduce a dedicated space for display benchmarks data on the Watch This Space website. The first set of metrics you’ll see available are the latest display benchmarks which cover the breadth of data from CTR metrics to engagement metrics for rich media ads such as interaction and expansion rate, video complete rates and average interaction times -- all across a broad range of ad sizes, creative types and industry verticals. Use of rich media ad formats have doubled. We saw a two-fold increase in the proportion of impressions going to Rich Media ads. In 2010, simple flash ads accounted for 54% of all global formats served via the DoubleClick for Advertisers platform, down from 74% in 2009. Image ads, in comparison, experienced an uptick with 28% of formats served in 2010 up from 17% in 2009. That leaves rich media ad formats growing to 18% of all the impressions served in 2010 up from 9% globally in 2009. Response and engagement rates have been holding steady since 2009. In the past two years, the overall click-through rate has remained steady at around 0.09%. Expansion rates have fallen considerably since early 2009 but now we are seeing rates leveling off with a slight uptick towards the end of 2010. Video completion rates on rich media ads have generally remained consistent except for a several month peak towards the later half of 2008. Larger ad sizes tend to generate greater response. Size does matter apparently. As we have seen in years past, bigger ads perform better. We observed this with the latest set of metrics in which the half-page ad unit (300x600) which had the highest CTR, interaction rate (for both in-page and expandable formats) and expansion rates of all the available creative sizes we tracked for the benchmarks. Although the U.S. had one of the lowest expansion rates, this market showed the highest expansion time. So Americans seem to expand ads less but when they do spend more time engaging with the ads themselves. In terms of industry verticals, auto advertisers performed the best in terms of CTR(0.13% for flash ads) but conversely had the lowest interaction (1.9%) and expansion rates (0.2%). For interaction rate, telecom (9.4%) and B2B (9.2%) advertisers were the highest while B2B stood out in terms of expansion rate (7.5%) benchmarks. A couple of notes about this latest set of online advertising benchmarks. The data for these benchmarks are derived from a robust data set across DoubleClick for Advertisers, based on rigorous methodology with input from the Advertising Research Foundation. The charts cover global benchmark figures for the entirety of 2010 by ad format, ad size and industry vertical. The benchmarks are normalized across hundreds of advertisers, thousands of campaigns, and tens of billions of ad impressions. For additional insights and access to the full set of available benchmarks, visit the benchmarks section on the Watch This Space website. More in-depth benchmarks by industry are available exclusively to DoubleClick clients so contact your account manager to discuss further. If you’re a DoubleClick Ad Exchange publisher, you’re undoubtedly on the lookout for new ways to gain better insights and visibility into your transactions and revenue. Today, we’re pleased to introduce a new level of flexibility to Ad Exchange reporting with the expanded beta of Multi-Dimensional Reporting. Multi-Dimensional Reporting can help you analyze the trends that matter most to your business by easily enabling you to “slice and dice” your Performance Reports across multiple criteria, including ad units, ad sizes and countries. 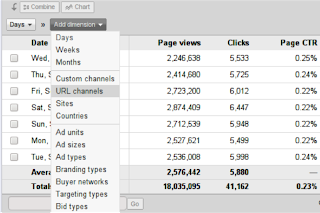 All Ad Exchange publishers can now add up to three dimensions to their reports and create combinations such as ad unit by country and branding type. To get started, simply click Add Dimension within the Performance Reports screen and select a dimension. Today, you can select up to three criteria and we will be expanding this number later in the year. We hope you find this feature useful in getting more insight from your Ad Exchange reports. Getting users the information they're looking for quickly is a very important motto for us here at Google. This is true for all of our products including DoubleClick for Publishers (DFP). Therefore, to make it even easier and faster to navigate through all of your DFP account data, we've been hard at work speeding up search. The new search interface shows you results as you type, allowing you to find your order and inventory data faster than ever before. Until now, you had to type a full search term, hit return, and hope for the right results. Now results appear instantly as you type, helping you see where you’re headed, every step of the way. 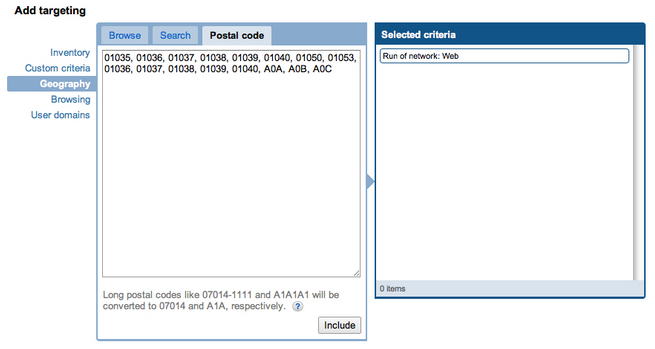 The new search allows you to search by name, size, and ID, across your orders, line items, ad units, and placements. We’re excited about the new search and confident that it will help save you time and make it even easier to find what you’re looking for.